Among the most notorious examples of intellectual property theft is the illegal manufacture of knock-off versions of Russia’s iconic Kalashnikov assault rifle by China and a handful of Eastern European countries. 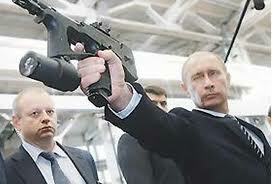 But the AK-47 is far from the only Russian weapon that is being copied. In fact, according to an article on DefenseWorld.net, the production of arms based on copied designs costs Russia and its defense industry $6B annually and President Vladimir Putin wants to do something about it. Putin was quoted as saying that the theft of intellectual property and the proliferation of illegal weapons made of Russian designs not only costs the country money, but has the detrimental effect of damaging Russia’s reputation. Stronger copyright protections and greater international cooperation on that front are the best way to protect the rights and interests of the state, manufacturers, and those individuals who hold patents. “Our task is to ensure a high level of protection for our science-intensive goods and intellectual property, and defend the rights of Russian producers, companies and inventions’ creators,” Putin said. Whatever you may think of Vladimir Putin or of his concern for Russian weapon designs, his sentiments as they pertain to the importance of IP protection are well founded. According to the International Anti-Counterfeiting Coalition, in 2011 authorities seized $200 million worth of bogus merchandise intended for sale in the United States alone, a figure that represents a fraction of the total trade in pirated goods here, not to mention the from black market trade around the world. Every dollar that is spent – whether knowingly or unwittingly – on a knock-off product is a dollar that does not benefit the rightful owner of the intellectual property behind the design or the legitimate businesses that manufacture, distribute, and sell the product. And while you might not have much sympathy for the fortunes of Kalashnikov Concern or Sukhoi Aviation Corporation, the detrimental economic effects on smaller companies whose futures are dependent on their own IP cannot be overstated. Beyond product designs, companies and consultants who have invested time and money to create new processes or works of art, for example, depend on the integrity of their innovations and rely on copyright protection (as well as the honesty of their partners, clients, and customers) to remain in business. For that, we wish Mr. Putin well in his fight to strengthen international copyright laws and agreements on behalf of Russia’s defense industry – and innovators everywhere.